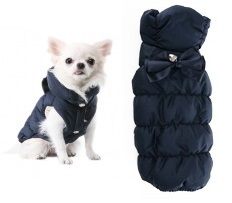 Staying warm in the winter has never been so stylish and your dog will certainly appreciate this Posh Pooch Coat from Puppy Angel. Made to fit perfectly the elegant style uses superior fabrics with an upgraded design complete with elasticated chest and trim. There is no hood on this dog coat but a higher neck sporting a pretty bow and pendant. Simply divine! Made from 100% Polyester for easy wash and wear. Available in sizes S SM M L XL.